Quentin Comus has a busy schedule for a high school senior. Between his commitment to the Boy Scouts, a job at the Chehalem Park & Recreation District and work with various other student and scout organizations, he found time to aid in the establishment of the Chehalem Valley Watershed Project. This extracurricular activity is of particular importance to Comus and his fellow student ambassadors, Riley Wood and Kennedy Rainey, all of whom have an interest in working in the natural resources field. The hands-on experience provided by their work with the project may prove invaluable. "Instead of sitting down and reading a book or writing a paper, students are actually going out and working alongside professionals," Comus said. "They're collecting real data used in reports and gaining the skills needed for the profession, rather than just checking off their science credit in a classroom." Research and restoration work are the backbone of what CVWP does. The students are involved in stream restoration projects, outdoor education events and environmental research, among other endeavors. Their work is supervised by NHS teacher Peter Siderius and requires $250,000 in funding, which has been paid for by individual donors, grants, the Ford Family Foundation, local Native American tribes, environmental protection groups and local businesses. Students often write grants on their own and do the majority of the work with hands-off supervision by Siderius. Comus said Siderius allows the students to be independent and learn through doing the work themselves, rather than actively involving himself in every step of the process. The result is a ripple effect on the community, Comus said. 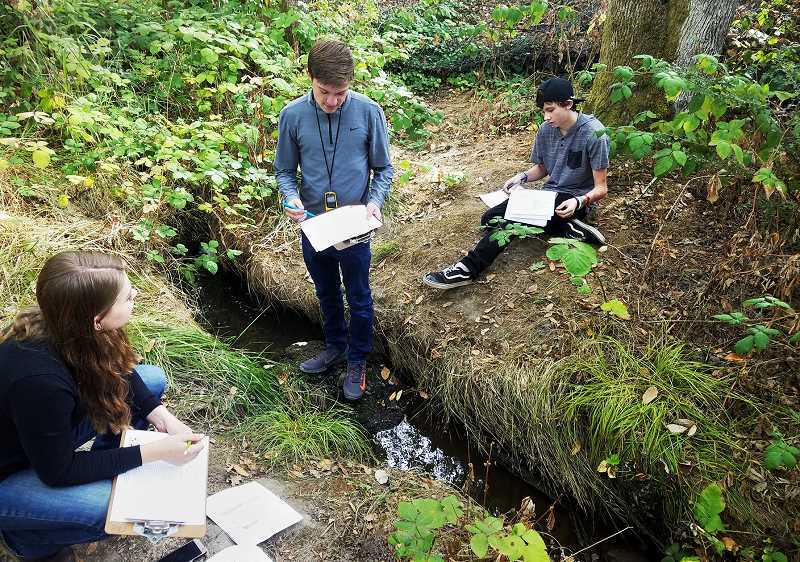 When CVWP first met with the city of Newberg, Comus said the city was skeptical of their work and – in his view – worried about what a bunch of students might find when they examined water quality. "We learned through our work that the city only has one person in charge of the watersheds and environment, and she can only spend a quarter of her time on it," Comus said. "That's alarming because there are so many things that are important to protect and keep healthy." CVWP just purchased its first set of water quality monitoring stations, making the Newberg School District the owner of the most technologically advanced water monitoring network in the state. Comus and his colleagues are in the process of building a high definition stream survey kayak as well, which will be just the second of its kind in the country, he said. All the work he and his fellow students do has an important impact on Newberg and its natural environment, Comus said. CVWP has also presented to a variety of civic organizations and helps educate young people in the school district about the outdoors. CVWP serves as Comus' senior project. The work he and his classmates do will be submitted for the William T. Hornaday Award – an award presented by the Boy Scouts of America for service in conservation and ecology. Next year, Comus will attend Oregon State University-Cascades in Bend, where he will study to be a teacher. He hopes to be in a similar position as Siderius someday. For now, however, his focus is on his hometown of Newberg, where he and his classmates have established themselves as a force for change in the fields of conservation and scientific research. "Newberg is on the fringe of transitioning from a rural community into a more suburban one as the metro area creeps slowly toward us," Comus said. "We have this opportunity to research how human development has an impact on our environment in a non-political way, not worrying about the bureaucracy at the state level or local level. We just go out there and do stuff that everyone can benefit from."